The Ionic Nu-Lift™ Rejuvenation System by Essona Organics is a powerful, lightweight, multi-purpose device with state-of-the-art ionic micro-current technology designed to help draw out impurities and to increase the absorption potential of the skin for immediate results. Cleanse, Balance, Nourish and Lift your skin, all with the press of a button! Expensive treatment at your doctor or beauty salon is no longer necessary, and you just need about 8-16 minutes to help draw out impurities and prevent the appearance of wrinkles, improve skin tone, elasticity and vibrancy. The skin tissue is composed of epidermis as the outer layer, dermis, and hypodermis that contains fat. Skin cells renew every 28 days. The protective membrane in the epidermis layer can isolate skin from the harmful environment and substances and protect it, but at the same time, it may hinder the skin from absorbing nutritious substances. The ionic Nu-Lift™ Rejuvenation System uses both micro current and galvanic current with specific polarity to help draw out the impurities on a deeper level. Meanwhile, the gentle current stimulates the skin with its thorough massage, which supports the development of healthy skin tissues and strengthens collagen and elastin fibers. Thus skin becomes delicate and soft, fresh and natural, full of elasticity, with a younger-looking glow! 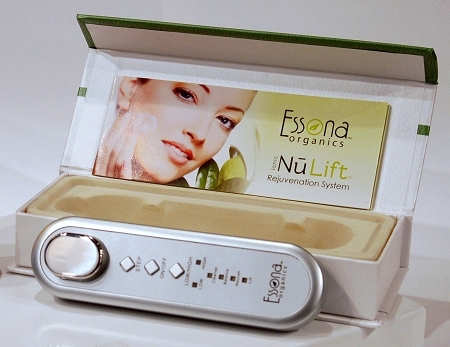 Includes NuLift Ionic Beauty Device, Instruction Manual, Gift Box. Batteries included. Complete instructions included. Watch video for more information. Slows down the visible effects of aging. Uses Ionic technology to draw out impurities. Allows Cleansing and Nourishing at a Deeper Level.